The main purpose of this paper is to illustrate those ways in which a detailed study of what is now a small market town may be illuminated by the results of both historical and archaeological analysis. Either approach, undertaken in isolation, would leave serious gaps in our knowledge. On the historical side, the paucity of written evidence in the two centuries before Domesday would bequeath but a sketchy insight into the nature and topography of the early settlement. In archaeological terms, the physical evidence which has emerged from excavation and topographical analysis would be impossible to interpret taken alone. The integration of both disciplines, however, makes it possible to present a fairly convincing picture of the development of a Scandinavian and pre-Scandinavian settlement into the Norman borough which it became. This is not to say that there are no problems of interpretation, far from it, but that the questions become, by this approach, easier to define, even if the answers remain stubbornly elusive. Figure 1: the Medieval Town. There is no evidence for any substantial occupation in the Middle-Saxon or Roman periods. The site bursts into prominence in the second half of the ninth century for two main reasons: firstly as the center of production of an extremely fine wheelmade and often glazed pottery, and secondly, and by implication, as a focus of Scandinavian settlement. By the middle years of the tenth century we learn that Stamford is one of the Five Boroughs of the Danelaw, with some unusual features not common to the other four. In the succeeding two centuries the commercial life of the town prospered, and it had grown by ca. 1250 A.D. into a mercantile center for trade both local and international, taking its place as one of the foremost boroughs of eastern England. 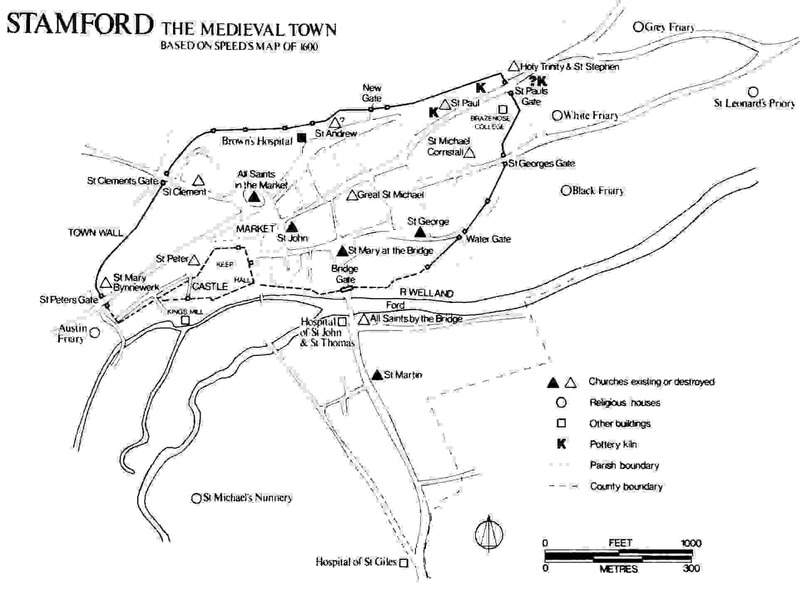 The first unambiguous documentary evidence for settlement in Stamford comes from the Anglo-Saxon Chronicle, sub anno 918, when we learn that "King Edward went with the army to Stamford, and ordered the borough on the south side of the river to be built; and all the people who belonged to the more northern borough submitted to him and sought to have him as their lord. "2 The relative positions of the two boroughs are made clear in this passage, but the identification of their sites has of necessity to rest very largely on the results of archaeological investigation. The earliest physical evidence for occupation is provided by the discovery of the kilns and products of a late ninth-century pottery industry. Prosaic as sherds are, they can give unsuspected illumination to the historical record. The products of the kilns discovered on the castle site are noteworthy and important for the fact that they display influences and parallels with Northern France, particularly the Beauvais area. When one considers the movements and inter-relationships of the Scandinavian armies in England and France at this time, it is hard to avoid the conclusion that the stimulus for the production of the Saxo-Norman pottery industries in such places as Stamford and Thetford derives from the Danish armies and, in Stamford, their French connections. If we indeed have a French potter working in Stamford in the second half of the ninth century, it seems likely that he came over with the armies, either as a commercial venture, or less voluntarily.3 In any case, it can be safely argued that the emergence of Stamford is closely associated with the political, economic, and social revolution initiated by the Danes; and the establishment de novo of Saxo-Norman pottery industries in Danish foci can be seen as but one small indicator of the radically new forces which were to transform the political and mercantile environment of eastern England. The rapid growth of the town in the first two centuries of its history attests not only to its commercial success, but also to its regional and at times national importance as a nodal point in the fluid interplay of Angle-Scandinavian relationships. Stamford was never just a settlement, to be regarded in isolation. The town must be seen right from the beginning of its history in a wider context—in the context of the complex territorial organization of which it was a part. Initially its importance was probably derived from its strategic position. The detailed topography of the site provided early settlers with a defensible position on a navigable waterway to the North Sea, although the initial colonization derived probably from landward expansion consequent on the division of the Mercian lands in the late ninth century.4 Subsequently Stamford became an important link in a chain of military centers which secured communication between East Anglia and the North. Although in the early years of the tenth century the threat to such a center must be thought to emanate from Wessex, it was not long before Stamford found itself an integral though not frontline element in the protection of the southern Danelaw against the north. Its geographical situation, at the junction of fenland to the east, the rich agricultural lands of Leicestershire and Rutland to the west, the Lincolnshire heathlands and the forest of Rockingham to the north and south, must have ensured its rise into a major center for commerce, as it was for administration. These various factors, political, military, administrative, and economic, ensured that Stamford emerged into the eleventh century as a quasi county borough with a distinctive character which although modified, survived the Norman Conquest. The town is today, like all historic urban centers, a palimpsest of its own history, and microcosm of its region. Only by studying the one, can we hope to understand the other. Thus our analysis must begin with an examination of the town itself. Initially the problem of the location of the Danish Borough will be considered. We shall then examine the development of the town and its role in the area, concluding with a consideration of the consequences of the Norman settlement. Stamford is apparently anomalous as a Danish center. Unlike Lincoln, Leicester, Nottingham, and Derby, it has neither Roman antecedents, nor extensive Middle-Saxon or non-Scandinavian Late-Saxon settlement. However, as we shall see, the Danes did not find a tabula rasa, but adapted their needs to a pre-existing territorial organization, which survived the Scandinavian settlement and had a profound effect on the growth and development of the town. In considering the problems of the early settlements, the starting point of our analysis must predictably be Domesday Book.5 It is not without reason that Domesday studies have been likened to an abstruse branch of nuclear physics.6 It is indeed possible, by means of detailed procedural arguments and complex genealogical analyses, to reconstruct the institutions of the town and to provide a detailed but somewhat impenetrable topographical description.7 But that is not strictly germane to our purpose. Rather, our analysis must be selective and more generalized. Firstly, we must consider that situation which obtained before the coming of the Danes; what elements, if any, might be identified as having an archaic character, essentially an Anglo-Saxon character; and what, if any, is the archaeological or topographical evidence to support it. The most obvious observation to make is that the text of the account of Stamford is divided into two parts.8 These relate broadly to what have been termed customary, and non-customary, tenements.9 The first section is concerned with those messuages which paid all customs to the king. It also includes certain privileged townspeople. These are the Abbot of Peterborough, who received toll and land-gable from the sixth ward of the town beyond the bridge, which otherwise rendered all custom; and the 77 sokemen "who have their lands in demesne, and seek lords where they will; over whom the king has nothing except the fines of their forfeiture, and heriot, and toll." The second is also concerned with more privileged tenements which were to a greater or lesser degree quit of custom. It includes the land of the lawmen, who had sake and soke over their own houses and their own men; land which belonged to contributory manors; two churches which were in various ways quit; and the estate of Queen Edith "which belonged to Roteland." The essential difference between these two groups is not one of tenure or status - for both are heterogeneous—but one of sake and soke, that is, the interception of regalian dues. The sokemen may be privileged, but they are still in the king’s soke, and no one but themselves benefits from their exemptions. In the second section, however, royal dues are siphoned off by various lords and they themselves are responsible for their tenements and men through rural manors or otherwise. Their estates are thus not an integral part of the king’s borough. The point is crucial, for it casts much light on an anomalous and important entry in the second section. This estate is unusual. It is three times larger than any other estate, comprising one-fifth of all recorded tenements in the town, and as much as five-sixths of the carucated land. Unlike most of the entries in section two, it did not belong to a "contributory" manor. It was part of the royal estate of Roteland. This estate was somewhat akin to a shire, and included many important royal manors, such as Oakham and Hambleton.11 Its inclusion in the second section suggests that the diversion of custom is at the essence of its status, and this is confirmed by the record of a value. Valuits and valets are extremely rare in the descriptions of Danelaw boroughs, for urban holdings are usually either, as customary, valued en bloc within the borough or, as non-customary, in the manor to which they belonged. But the formula has a specific significance in circuit 6 of Domesday Book as a whole; it generally indicates the point at which dues are collected, and is intimately connected with the term manerium. This term, in itself closely related to the term aula, hall, indicates the point at which dues, soke or custom, are intercepted.l2 The customary nexus of Queen Edith’s estate in Stamford, then, appears to be not a rural manor, nor the king, but the tenement itself. In other words, the estate is a manor. In 1066, then, Queen Edith’s fee was a manor located close to the borough, but not part of it. This estate was a very ancient feature of the town. Crucial evidence is provided by the church of St. Peter (Fig. 1). The Domesday Book entry is as follows: "Albert [had] one church, [that] of Saint Peter, with 2 messuages, and half a carucate of land which belongs to Hambleton in Roteland. It is worth 10 shillings. "13 Albert is Albert of Lotharingia, a churchman of some importance before the Conquest, who nevertheless managed to maintain his position in the reign of King William.l4 His fee in Roteland was made up of the churches of Queen Edith’s manors of Oakham, Hambleton, Ridlington, and St. Peter’s in Stamford.15 Just as his church of Oakham was the church of Queen Edith’s manor in that settlement, so it seems likely that St. Peter’s in Stamford was the church of her manor there. If we accept that churches and manorial halls were usually closely associated, the site of St. Peter’s church may give some indication of the nucleus of Queen Edith’s extra-burghal estate.16 If we accept such a nucleus—and the site of St. Peter’s church is known and exists as a grassy knoll just west of the castle motte—we can begin to ask questions about the extent of the fee. The church and manor between them possessed all the carucated land in Stamford, altogether some three carucates, which suggests a considerable amount of land within the context of Roteland. This impression is reinforced by an examination of the ecclesiastical parishes, in origin closely related to the area of estates (Fig. 2). In the nineteenth century, before enclosure, almost the whole of the fields of the town were in the amalgamated parishes of All Saints and St. Peter.17 It is not now possible to disentangle the lands of each, but Stukely recorded the tradition that St. Peter’s had large parochial precincts, which he used as an argument to demonstrate that it was the first church of the town.18 We can confirm that the church had indeed extensive glebe in the West Field of Stamford, and that its parish covered a large area of the common fields.19 Other parishes, those of St. Mary Bynnewerk, and the pre-Conquest St. Clement, were probably carved out of this territory.20 The original parish of All Saints is unknown, but was probably substantially a now detached portion of the present parish, enclosed within the bounds of St. George. The likely size of the parish of St. Peter tends to support the suggestion that it was the "mother" church of the town, and this in turn would suggest that the estate associated with it is primary. Figure 2: the Medieval Town. Two independent categories of evidence, archaeological and topographical, support this conclusion by indicating the primary nature of the St. Peter’s church nucleus. Immediately to the south and east of the site of St. Peter’s church lies an area which came to be occupied by the Norman castle. It is from here that the earliest evidence for occupation in Stamford comes. During the excavation of the castle, a number of very much earlier features came to light. In particular part of a double-ditched enclosure with an internal palisade was found (Fig. 3). Badly disturbed to the west and east, the enclosure could nevertheless, if produced, have encircled the knoll on which St. Peter’s church had stood. There is evidence that it was in use for only a short time, for at least part was quickly back-filled. Clearly it was either defensible, or a very well-marked boundary.21 In the filling was a coin of Alfred, and intimately associated with the outer ditch were pottery kilns dated archaeomagnetically to the second half of the ninth century.22 The nature of the occupation contained within the ditched circuit is unknown, but the possible association of an early church of a royal estate with a palisaded enclosure, may suggest the presence of an aula. Whatever its function the importance of the site is evident, and its primary nature is supported by the second category of evidence, the topography of the town. The route to the bridge from the south appears to be a divergence from a more direct, and possibly earlier route, the causeway across the meadows (Fig. 4). This latter route links with Castle Dyke, which marked the eastern extremity of the castle, and the parish boundary between All Saints/St. Peter and St. John. We shall return to the Edwardian burh and to the river crossings, but for the moment it is sufficient to note that if the bridge is as early as 918, and if the causeway antedates it, then the fact that the causeway connects with the area round St. Peter’s, may be some indication that the occupation of this region could go back to the late ninth century, as does the pottery industry and the enclosure. As we have seen, there is a close association between the St. Peter’s/All Saints nucleus and Roteland. Phythian-Adams has argued that the medieval county of Rutland, arising in the twelfth century, recognized the integrity of a royal estate which split into two between 894 and 917 (Fig. 7).25 Witchley Hundred, immediately to the west of Stamford, was appended to Northampton and appears under that heading in Domesday Book. The wapentakes of Martinsley and Alstoe, the Domesday Roteland, maintained their autonomy though they were subsequently associated with Nottinghamshire for the purposes of the geld.26 Queen Edith’s 70 messuages were part of this estate of Roteland and her title to this land in Stamford was clearly derived from her title to the area as a whole. Since the fee would appear to be primary to the town, it is thus likely to be a remnant of the larger estate of Rutland before it split up. This estate was of considerable antiquity and was probably of an archaic structure by the early tenth century, perhaps deriving from Middle Saxon or earlier origins.27 In territorial terms, then, much of what became the town of Stamford must have belonged to Rutland before the Danish settlement. There is no archaeological evidence of a substantial, or indeed any, Mercian settlement, but it seems clear that an ancient territorial relationship was recognized and accepted by the Danes, for this estate was evidently not part of their borough. This recognition is suggestive. The existence of an early royal church, possibly associated with the palisaded enclosure points to the importance of the estate and its survival suggests the continuity of regalian functions throughout the political instabilities of the Scandinavian occupation, and into the eleventh century when King William used the same site for the establishment of his castle. If this interpretation is correct, it is clear that the Danish Borough must be sought elsewhere, but first it is necessary to look briefly again at the burh of Edward the Elder, south of the river (Fig. 5). The existence of a mint, or at least a moneyer, in this part of the town together with the place-name Burghley, borough-wood, immediately to the south-east of High Street Saint Martins, suggests the existence of something more than a marching camp.28 The location of the site is fraught with problems. It is likely to have commanded the river crossing, either the causeway mentioned above, or the ford which still exists just downstream of the present bridge. It is possible to see High Street Saint Martins as the axial road of a planned complex, post-dating both ford and causeway The northern limit is perhaps indicated by a curve in the road twenty yards south of the bridge, the eastern and southern boundaries by lanes, and the south-east sector by a parish boundary. A ditch antedating a Saxo-Norman quarry was found on the proposed line, just west of Burghley Lane. The area encompasses the limits of settlement to the south-east and west in the twelfth century, and its axial road is marked by the two churches of St. Martin and All Saints-by-the-Water, the latter possibly a pre-Conquest foundation.29 This represents, from all available evidence, not forgetting the distribution of pottery, the most likely site for Edward’s burh. Looking now to the north of the river, we must consider the site of the Danish Borough which Edward found when he came to Stamford in 918. There are several ways of looking at this problem, but fortunately the various strands of evidence all point in approximately the same direction. They suggest the establishment of a planned town to the east of the All Saints/St. Peter’s complex, and antedating the bridge. Our earliest map is that of John Speed (Fig. 6) of the early seventeenth century. From it we can see that the street-plan of the town has changed hardly at all in the last three and a half centuries, and we are thus able to draw to a modern scale (Fig. 1) a base-map incorporating those elements which Speed represents. The next step is simply to subtract from the plan known late features, such as the medieval town walls and the extra-mural roads (Fig. 4). We are left with what appears to be a planned nucleus, separated from the castle by a market; in other words exactly what one would expect. As we have seen from the historical evidence, we would predict that the borough would not be in the region of St. Peter’s church, nor is it. It is sited on an adjacent spur overlooking the narrowest part of the river. The detailed topography supports this interpretation and has been extensively argued elsewhere.30 Briefly, there is the matter of the dog-leg performed by what was the Great North Road on its route from the town bridge to the market place by All Saints, which suggests that it is skirting a pre-existing complex. Both the street plan and the pattern of tenement plots tend to confirm the suggested nucleus. We are left then with what appears to be a sub-rectangular early nucleus with High Street as its east-west axis. The western prolongation of High Street joins with the All Saints/St. Peter’s nucleus which we have already suggested antedates the borough, and it may be that this road, too, is earlier than the Danish settlement and was simply utilized in its planning (Fig. 5). Topographically, our planned area would appear to predate the complex south of the river, if we believe the latter’s axial road to be aligned on the bridge. The archaeological record, then, so far as it goes, supports the 918 annal, and also the arguments from Domesday Book as to the siting of the Danish Borough. The discovery of sherds of Stamford ware deriving from the castle kiln under the eastern defenses of the proposed borough indicate too that the planned settlement post-dates, if only by a little, the establishment of the pottery industry, and by implication, the digging of the ditched enclosure on the castle site (Fig. 3).33 Whether the Danes were responsible for this minor fortification, or whether it was an essentially Mercian manifestation remains unknown. What is likely is that the Danes took over the site, incidentally establishing a pottery industry there. But their main center of activities was on a similar knoll further to the east, where a fortified borough was established in the years preceding 918. This planned borough was distinct from the estate of Roteland to the west, and may have been associated, as we shall see, with the areas of Kesteven and Holland to the north-east. We have dealt at some length with the detailed topography of the town because this is an essential preliminary to considering its role in the region. We now come to the very important matter of attempting to place Stamford in its wider context, and the next section is devoted to a consideration of its territorial affinities in the years preceding the Norman Conquest. An essential element in the functioning of a Danelaw, or indeed a Wessex borough, was the territory which it could look to for its sustenance and support, and for Stamford this presents unusual problems. In the case of all the other members of the confederacy of the Five Boroughs, the burghal territory became rationalized into the institution of the shire. Such was not the case with Stamford. Various references have indeed been adduced to prove that "Stamford-shire" formerly existed, but all the sources are unreliable or of dubious authenticity.34 Moreover the term "shire" in the context is probably anachronistic. C.S. Taylor has argued that the institution of the shire with its separate royal administration was introduced into Mercia in the early years of the eleventh century in response to the need to marshal resources to counter the renewed Danish attacks.35 At this time Stamford was indubitably part of Lincolnshire. The annal for 1016 illustrates that the town was on the boundary between Lincolnshire and Northamptonshire and the pattern of administration as revealed by carucation, shows that it was an integral part of the former.36 The notion of "Stamford-shire" is therefore inappropriate since the town was already attached to Lincoln at the time when the institution of the shire as we know it was introduced. It seems therefore that from 917 the territory of Stamford must have lain to the east and north. Its northern limit is almost certainly indicated by the southern extent of the kingdom of Lindsey, with which Lincoln was intimately associated (Fig. 8). Stenton has argued that the Ridings of the division and its "island" topography indicate that it was in existence in the early Danish period, and it is probably coterminous with the earlier kingdom.47 The contributory manors of Lincoln itself, where discernible, are all in the area and the division between Lindsey and south Lincolnshire marks a very pronounced tenurial boundary in the mid-eleventh century.48 No western limit can be suggested unless carucation was as early as the mid-tenth century. If this was the case, then Stamford was closely associated with the area of Kesteven from this time, for it was an integral part of its local government apparatus.49 This area was, like Lindsey, topographically discrete. Holland, to the east, was equally isolated, but was almost certainly associated with Stamford. Its lines of communication are mostly through Kesteven, and procedurally it was part of that division when the Lincolnshire Domesday was compiled.50 Moreover the customs of king and earl in Sudlincolia, that is Kesteven and Holland, were rendered together amounting to £28. Significantly, Stamford is said to have rendered exactly the same sum, and it is possible that the two figures are one and the same render.51 We may conclude then that the territory of Stamford extended from the Welland to the Witham. Thus Lincoln and Stamford were situated on the peripheries and to the south of their regions, so that they could control the entrances to the two areas, commanding the main lines of communication between the Danish colonies in the north, and the southern Danelaw and East Anglia. As for what was going on on the castle site we have no archaeological evidence. The area of the motte, now under a bus station, has not been available for excavation. A shell-keep was destroyed, and no doubt many underlying layers as well, in 1933.62 Once again we have to turn to Domesday Book where we learn that five mansiones were waste on account of the work at the castle, as compared with 166 at Lincoln.63 However, strictly speaking this cannot be taken to indicate the level of land use before the construction of the castle for it does not record the number of structures which were destroyed. The term mansio may have a primarily legal meaning, for frequently contrasted with domus, it refers to something more than actual physical structures.64 Moreover, reference is only made to the wastage of those mansiones which had formerly paid custom. Wastum itself is a technical term. Although it must frequently imply complete destruction of a tenement, nevertheless land could be waste, and yet still be worked.65 It is clear in these cases that the term has the primary meaning of loss of revenue. Thus in recording that five mansiones were waste on account of the work of the castle, the commissioners were not noting the destruction of five buildings, but the loss of revenue which had been owed to the king from five ill-defined entities. Since, as has been argued, the castle was situated in or adjacent to the nucleus of a large non-custom-paying manor, many other mansiones and structures may have been destroyed but have gone unrecorded since their destruction did not affect the total customs of the town. The area south of the motte, which became the castle bailey, was extensively excavated, but the slightly built timber structures which may have existed on the site before 1066 were not found due to extensive later stone-quarrying, and other disturbances.66 Even had they been found, they would have been difficult to date, for it has often been said that in regard to pottery studies, there is no evidence for the Norman Conquest at all! Of the institutional framework found by the Normans we know little, but we have speculated that the royal manor centered on St. Peter’s maintained its integrity down to 1066. It was probably in 1068 that the Normans chose the nucleus of that very royal estate as the site for their new castle. The reasons for their choice were no doubt concerned as much with military strategy and convenience, as with the conscious perpetuation of a regalian function. Elsewhere they had few qualms about disturbing the status quo. Certainly the military problems facing the Normans were not dissimilar to those which the Danes had encountered some two hundred years previously. Characteristically also, the rationalizing grip of the Normans can be discerned in the manner in which they solved the problems posed by the antiquated and absurdly anomalous tenurial and administrative arrangements of the town. The site of the castle, adjacent to the Danish Borough and on a neighboring knoll, must have been equally defensible (Figs 4 and 5). The motte required little artificial heightening to enable it to dominate the western approaches to the borough, the early river crossing from the south, and a large triangular area between the borough and St. Peter’s where there is evidence for a market from at least the twelfth century. Superficially the topography suggests that the fortification fitted into the classic pattern of castle, market, and town, which we see at Nottingham.71 This impression is probably erroneous. Hoskins and Rogers have used a curious reference to Portland in the Northamptonshire Domesday to argue that the construction of the castle was linked with the creation of a Norman market place between All Saints and St. Peter’s. This entry is anomalous, since it is the only parcel of carucated land in the whole of the Northamptonshire Domesday.73 Although the place-name is not found after 1086, Portland can be confidently associated with Stamford. It is a later but foreseen addition to the text, but is grouped with those manors which were subsequently in the county of Rutland.74 However, Portland cannot be a Norman innovation, for it is given a TRE value. Moreover it cannot have been situated in the market place. The two churches were not, as Hoskins and Rogers claimed, located in Portland, indeed the use of the iacet ad formula implies quite the opposite, but merely held land there. From the available evidence then, the construction of the castle was probably not accompanied by major topographical replanning. But the Portland reference does provide an understanding of an associated reorganization of administration. Since it is associated with the Rutland manors, it can be identified with that part of Stamford which was in the same county in the later Middle Ages, namely the hamlet of Bradcroft and the west field of Stamford.75 This was bounded on the east by Ermine Street and was significantly known as "Sundersoken"—estate apart. Both location and name suggest that Portland had formerly belonged to an estate in Stamford, and, as non-customary land held by the king, it is difficult to escape the conclusion that it formerly belonged to the only royal estate of that kind in the town, namely Queen Edith’s fee. Domesday Book significantly informs us that her 70 messuages belonged to Roteland, that is, in 1066. In 1086, however, they were part of Stamford in Lincolnshire. It can be suggested, then, that the Normans, faced with the need to build a castle on land administratively not part of the borough of Stamford in Lincolnshire, incorporated the urban element of the fee into the borough. At the same time its agricultural counterpart was appended to the nearest royal manor, either Great Casterton, or Ketton, in Rutland (Fig. 7). The Portland reference, then, provides no evidence for the status of the market place, still less that it is of post-Conquest origin. On the contrary it is to be expected, given the probable pre-Conquest foundation of All Saints, and the town’s burghal status from the tenth century onwards, that a market place existed in the late Saxon period on the very site proposed by Hoskins and Rogers, between All Saints and St. Peter’s, that is from the Danish Borough to the possible royal aula which could have provided its institutional basis. Thus the castle was probably inserted into a topographical framework which had been established at least 150 years before its construction, and the administrative arrangements were adjusted to accommodate it. The later history of the castle is inextricably linked with that of the town and its lords, though unfortunately the first hundred years of its history are the most obscure, both in historical and archaeological terms. No reference is made to its structure between 1086 and 1153, when it ultimately failed to withstand a siege from the forces of Henry of Anjou.76 This was its only known military engagement. Writing in the mid-twelfth century, the author of De Gestis Herewardi Saxonis, makes mention of a Great Hall with an inner room, but this work is not the most reliable of chronicles—Hereward is supposed to have been guided to Stamford by a Wolf.77 As far as we know the borough and presumably the castle were in royal hands until 1156.78 Unfortunately nothing is known of the role of the castle in the administration of the town. The prosperity of the town was based on a number of factors. Firstly, it was a local market for a rich agricultural area with easy communications by water and road, and many religious houses acquired land in the town. Secondly, the town was a center for industry. In the twelfth century the pottery industry was still flourishing and continued to do so until the mid-thirteenth century. The challenge of the cheaper but nastier rural potteries had not yet been felt.82 Much more importantly, Stamford was the center of production of a high quality wool cloth, which came to clothe some of the highest in the land, as well as being exported as far afield as Italy.83 The export of raw wool was also a decisive factor in the town’s mercantile success.84 Most of the evidence for Stamford’s trading connections comes from the thirteenth century, but there is no doubt that this merely reflects the later elements in a success story which began at least as early as the eleventh century. This paper is not of course concerned with the thirteenth century, which is outside our terms of reference, but it is worth observing that in Stamford, as in so many English towns, the thirteenth century was the time when it took on the characteristics which we would recognize today; it was a period of change, the substitution of stone for timber in domestic building, in castle building the enlargement and embellishment of existing structures, in church building, wholesale reconstructions which quite sweep away any record of Norman predecessors, and in mural building the reconstruction of the town walls in stone. On the archaeological front there is a veritable explosion of evidence, as there is on the historical. 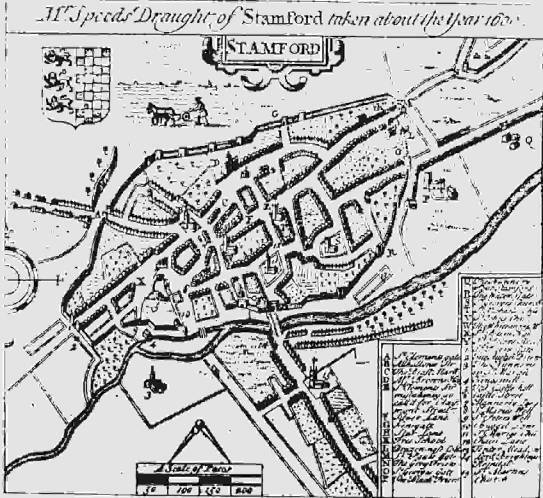 By 1250 the town had taken on the form which it had when Speed drew his map in about 1600, and this is the Stamford which, despite more than three centuries of piecemeal alteration, the observant eye can still, in 1982, detect. 1. A.M.J. 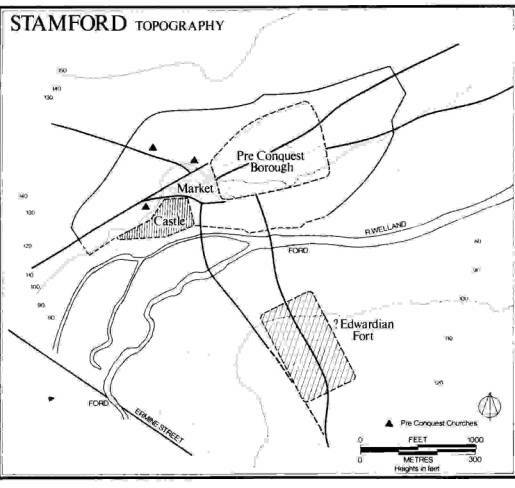 Perrott, "The Place-Name Stamford," Stamford Historian 2 (1978): 38-40. The crossing to the east of the town bridge is identified as the eponymous ford. However, in the light of possibly authentic notices of the early use of the name and the development of the town, it is far more likely to refer to the Roman ford. 3. K. Kilmurry, The Pottery Industry of Stamford, Lincs., c. AD 850-1250 (Oxford, 1980), 195; Kathy Kilmurry, "The Production of Red-Painted Pottery at Stamford Lincs.," MA 21 (1977): 180-6, at 184. 4. Kilmurry, Pottery Industry, 145. 5. DB 1, fol. 336d; The Lincolnshire Domesday and the Lindsey Survey, ed. C.W. Foster and T. Longley, (Horncastle, 1924), 9-11. This latter edition (hereafter Lincs. DB) is used for Lincolnshire references to facilitate the identification of individual entries. 6. Apud signum scaccorum ad Bellum festo Sancti Jacobi anno regni regine Elizabethe secunde trecesimo prime superauditum. 7. For the general method, see D.R. 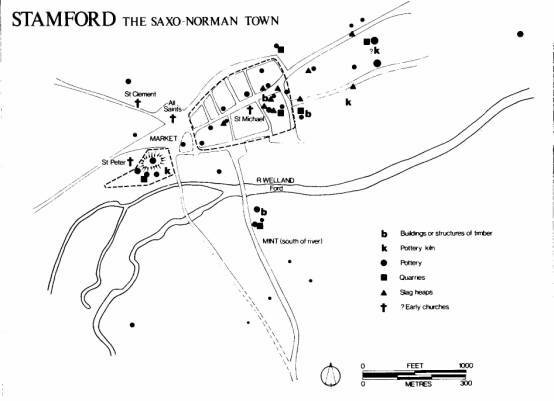 Roffe, "Rural Manors and Stamford," South Lincolnshire Archaeology 1 (1977): 12, 13. 8. Lincs. DB, 9/1-4; 9/5-11/16. 9. J. Tait, The Medieval English Borough: Studies on its Origins and Constitutional History (Manchester, 1936), 89. 11. Charles Phythian-Adams, "Rutland Reconsidered," in Mercian Studies, ed. Ann Dornier (Leicester, 1977), 63-84, at 64. 12. D.R. Roffe, The Making of the Lincolnshire Domesday, in preparation; F.M. Stenton, Types of Manorial Structure in the Northern Danelaw, Oxford Studies in Social and Legal History 2 (Oxford, 1910), 32-4. 14. E.A. Freeman, A History of the Norman Conquest of England, 2 (Oxford 1867), appendix; J.H. Round, The Commune of London and Other Studies (Westminster, 1899), 28-38. 15. DB 1, fol. 294a. 16. Frank Barlow, The English Church 1000-1066: A History of the Later Anglo-Saxon Church, 2nd ed. (London and New York, 1979), 94. In the Lincolnshire Domesday 72% of all recorded churches occur in manorial entries and appear to be eigenkirchen. 17. Dewhurst and Nichols’ Map of the Borough of Stamford, 1839, Town Hall, Stamford. 18. Cambridge, Corpus Christi College, MS. 618, fol. 66. 19. J.S. Hartley, A. Rogers, The Religious Foundations of Medieval Stamford (Nottingham, 1974), 43; C.N.L. Brooke, M.M. Postan, Carte Nativorum: A Peterborough Abbey Cartulary of the Fourteenth Century, Northants. Rec. Soc., vol. 20 (1960), nos. 397, 405, 560. 20. A. Rogers, "Parish Boundaries and Urban History: Two Case Studies," Journal of the British Archaeological Association, 3d ser., 35 (1972): 59. 21. C.M. Mahany, "Excavations at Stamford Castle 1971-1976," Château Gaillard 8 (Caen, 1976): 232-3. Both ditches had depths of between 4 ft. 6 in. and 5 ft. The widths at the top were between 6 and 9 ft., depending on where the measurements were taken. Due to disturbance of the upper levels, it is possible that the ditches as originally dug were somewhat, but not greatly, deeper. 22. The kiln was sampled by A.J. Clarke of the Ancient Monuments Laboratory, Department of the Environment, and measured in the Department of Geophysics and Planetary Physics, University of Newcastle-upon-Tyne. The combined results of archaeomagnetic and radiocarbon dating suggest a date in the second half of the ninth century. 23. 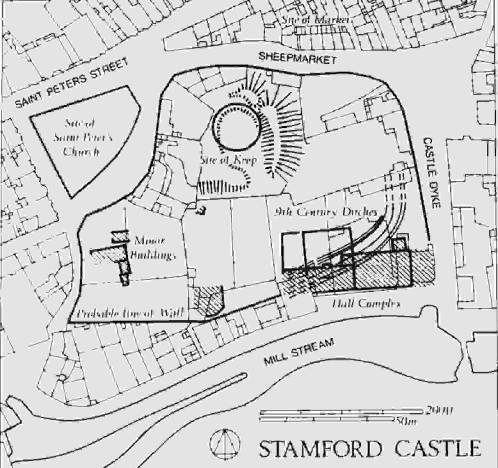 The Town of Stamford, Royal Commission on Historical Monuments (London 1977), 54-5. 25. Phythian-Adams, "Rutland Reconsidered," 72-3. 26. DB 1, fols. 219b,c, 293c,d, 294a. 27. Phythian-Adams, "Rutland Reconsidered," 78. 28. The Chronicle of Hugh Candidus, A Monk of Peterborough, ed. W.T. Mellows (Oxford, 1949), 70; F. Peck, Academia Tertia Anglicana or the Antiquarian Annals of Stanford (London, 1727), Bk. 4.24; E. Ekwall, The Concise Oxford Dictionary of English Place-Names, 4th ed. (Oxford, 1960), 75. 29. No record survives of the patron of the church of All Saints before it was acquired by St. Michael’s Nunnery, Stamford, but it is one of the few churches in the town in which the lord of Stamford apparently had no interest (Hartley and Rogers, Religious Foundations, 20). It may thus be one of the two churches held by Eudo Dapifer in 1086 (Lincs. DB, 11/6). His successors, as lords of Wakerley, Northants., to which the Domesday Book fee was appended between 1066 and 1086, held land in Stamford south of the river (Roffe, "Rural Manors," 12, 13). 30. Christine Mahany, Alan Burchard, Gavin Simpson, Excavations in Stamford Lincolnshire 1963-1969, The Society for Medieval Archaeology Monograph Series, no. 9 (London, 1982), 6-8. 31. C.M. Mahany, Stamford: Castle and Town (Stamford, 1978), 10, 11. 33. Kilmurry, "The Production of Red-Painted Pottery at Stamford Lincs," 181. 34. R. Butcher, The Survey and Antiquity of the Towne of Stamford, 4, repr. in Peck; Symeonis Dunelmensis opera et collectanea, ed. J. Hodgson Hinde, Surtees Society, vol. 51 (Durham, London, and Edinburgh, 1868), 1:221, citing the Arundel MS. reading of a list of shires in a section entitled "Excerpta historica et topographica"; T.M. Hearne, A Collection of Curious Discourses (Oxford, 1720), 33. 35. C.S. Taylor, "The Origin of the Mercian Shires," in Gloucestershire Studies, ed. H.P.R. Finberg (Leicester, 1957), 17-51, at 23-9. 36. ASC, 94-5; D.R. Roffe, "The Lincolnshire Hundred," Landscape History 3 (1981): 34-5. 37. Taylor, "Origins of the Mercian Shires," 30. 38. D. Hill, An Atlas of Anglo-Saxon England (Oxford, 1981), 85. 39. ASC, 66; Worcester 1.128. 40. See, for example, ASC, 64, 66. 41. The Town of Stamford, xxxvii; Rogers, 61. 42. A.M.J. 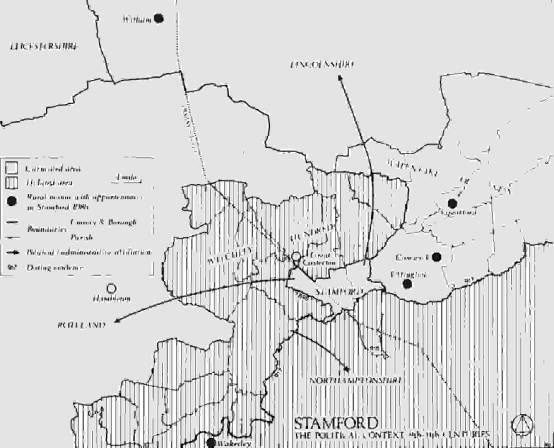 Perrott, "The Place-Names of Stamford and the Wapentake of Ness, Lincolnshire," Stamford Historian 4 (1980): 41. 43. Brooke and Postan, nos. 403-6, 560. 44. Roffe, "Lincolnshire Hundred," 35. 45. ASC, 66; Cyril Hart, The Hidation of Northamptonshire, [Leicester University], Department of English Local History, Occasional Papers, 2d ser., 3 (Leicester, 1970), 39; F.W. Maitland, Domesday Book and Beyond (Cambridge, 1897), 458; F.M. Stenton, "Æthelweard’s Account of the Last Years of King Alfred’s Reign," in idem, Preparatory to Anglo-Saxon England: Being the Collected Papers of Frank Merry Stenton, ed. D.M. Stenton (Oxford, 1970), 8-13, at 11. 46. The Chronicle of Æthelweard, ed. A. Campbell (London, 1962), 51; F.M. Stenton, "Æthelweard," 10-11. 47. F.M. Stenton, "Lindsey and its Kings," in Preparatory to Anglo-Saxon England, 127-35, at 133-4. 48. J.W.F. Hill, Medieval Lincoln (Cambridge, 1948), 46-7, 51; Lincs. DB, 3 /4, 24/72; 3/8, 17/1; Roffe, Lincs. DB. 49. Roffe, "Lincolnshire Hundred," 34. 50. The disputes of Holland are recorded without rubric and are an integral part of the section entitled Clamores in Chetsteven (DB 1, fols. 376d-377d). The wapentake sequence of this section is found, with only slight modification, throughout the body of the Lincolnshire text. 51. Lincs. DB, 7/27; 11/16. 52. H.R. Loyn, "Anglo-Saxon Stamford," in The Making of Stamford, ed. A. Rogers (Leicester, 1965), 31. 53. F.M. Stenton, "Lindsey," 133; DB 1, fols. 348a,b, 368a,b. 54. Roffe, "Lincolnshire Hundred," 34-5. 55. Roffe, "Lincolnshire Hundred," 34. 56. Hi11, Medieval Lincoln, 69-73. 57. A.W. Mawer, "The Redemption of the Five Boroughs," EHR 38 (1923): 551-7; D. Whitelock, "The Conversion of the Easter.n Danelaw," Saga Book of the Viking Society, 12 (London 1945), 159-76; W.E. Kapelle, The Norman Conquest of the North (London 1979), 14 -15. 59. Liebermann, Gesetze 1:228; EHD 1:403; F.M. Stenton, Anglo-Saxon England, 3rd ed., (Oxford, 1971), 510-12. 60. The two shires of Nottingham and Derby seem to have been closely related at the time of Domesday Book—there was apparently only one sheriff for the two shires before 1086 (DB 1, fol. 260b), the account of the borough of Derby follows that of Nottingham before the Nottingham breves (fol. 280a) and there is only one section relating to the customs of the two shires (fol. 280c). There has been no systematic study of the carucation of the two counties. Stenton (VCH, Rutland, 1:126-8) suggests a quota of 576 carucates for Nottingham and gives a total geld liability for Derbyshire of 679 carucates. Taylor (28) saw the combined total of 1,246 hides (sic), as reckoned by Maitland, as suggestive of the use of the 1200-hide unit for the combined area of the two later shires. This does indeed chime well with the use of a 50 twelve-carucate-hundred unit, that is, 600 carucates, in Lincolnshire (Roffe, "Lincolnshire Hundred," 34-5). But the peculiarities and complexities of carucation in the latter county, notably the apparent separate fiscal administration of royal/comital lands, should counsel caution. However, if the same arrangement obtained in Nottinghamshire and Derbyshire, a quota of about 500 carucates for each shire is suggested. Again, a common authority is indicated. An examination of the hundred/villar structure in the two counties would go a long way to elucidate the problem. 61. Mahany, Stamford Castle, 9. 62. Mahany, Stamford Castle, 16, 19. 63. Lincs. DB, 9/2; 7/25. 64. See, for example, DB 1, fol. 280a. "Robert of Busli has 3 mansiones in Nottingham in which 11 domus are sited, which pay 4s. 7d." 65. See, for example, Lincs. DB, 3/9; 4/36; 18/18; 32/26; 44/4. 66. Mahany, Stamford Castle, 18. 68. Worcester, 2.2; Orderic, 2.218. 72. W.G. 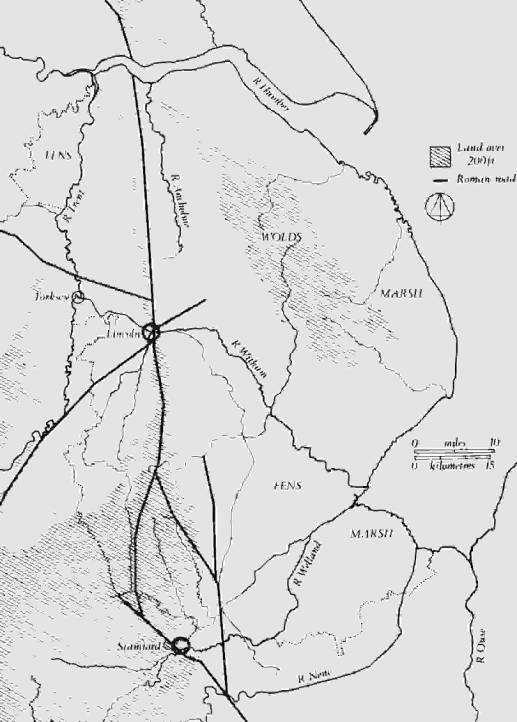 Hoskins, Fieldwork in Local History (London 1967), 25; Rogers, "Boundaries," 60; DB 1, fol. 219c. 74. The diplomatic of the entry—the use of the rex tenet formula, the record of a valet and valuit—suggests that Portland was an independent estate. An apparent association with Great Casterton is merely a function of over-compression, the scribe having left insufficient space for the information. 75. Documents Illustrative of the Social and Economic History of the Danelaw, ed. F.M. Stenton (London 1920), no. 44; Calendar of Ancient Deeds 3:D174; Calendar of Close Rolls 1302-7, 293, 1333-7, 240-1, 684, 705; Calendar of Patent Rolls 1301-7, 470, 1330-4, 104-5, 404; Calendar of Charter Rolls 3:122; Peck, Bk ix, 56, x, 8, xi, 47, 58, xii, 5. 77. De Gestis Herewardi Saxonis, trans. W.D. Sweeting (Peterborough, 1895), 64. 78. W. Dugdale, The Baronage of England (London, 1675), 1:631; Cal. Docs. France 1:530; Pipe Roll for the Second Year of the Reign of Henry II, p. 2. 79. Mahany, Stamford Castle, 7. 80. Hartley and Rogers, passim; The Town of Stamford, 46-7, 128, 146. 81. Excavation in the garden of Torkington House, St. Peter’s Street, directed by C.M. Mahany for Stamford Archaeological Research Committee in 1972. 82. Kilmurry, Pottery Industry, 196-200. 83. E.M. Carus-Wilson, Medieval Merchant Venturers: Collected Studies (London, 1954), 198, 209, 211-13, 220, 234, 238; Eleanora Carus-Wilson, "Haberget, a Medieval Textile Conundrum," MA 13 (1969), 148-66, esp. 161. 84. A. Rogers, "Medieval Stamford," in The Making of Stamford, ed. A. Rogers (Leicester, 1965), 43-6, 58. 85. Line drawings by R.S. Langley.